Sudanese Foreign Minister suggested that Israel was involved in an explosion that killed a suspected arms smuggler in Port Sudan on Tuesday. Sudanese Foreign Minister Ali Ahmed Karti suggested Tuesday that Israel was involved in an explosion that killed a suspected arms smuggler in the eastern Sudanese city of Port Sudan. 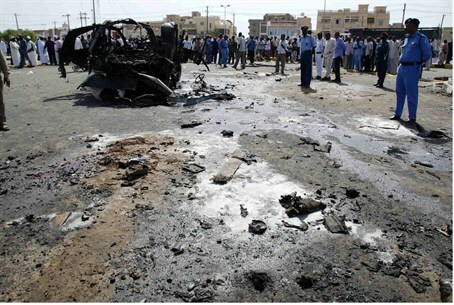 The blast happened just before 8:00 local time on the western edge of Port Sudan town, the AFP news agency reported. "I heard a big explosion and I came out and saw a [Toyota] Prado car on fire, and two craters in the ground," one resident told the news agency. Sudanese TV has been broadcasting pictures of the damaged front of the car. It said an "unknown source" had "attacked a civilian vehicle". While the minister stopped short of explicitly blaming Israel, he said the explosion resembled a blast in April 2011, which Khartoum blamed on an Israeli missile strike. "The style of the car explosion was similar to Israel's attack on Red Sea state (in 2011)," he told the pro-government al-Shorooq television station, according to its website. A foreign ministry spokesman confirmed the remarks. Israeli government spokesman Yigal Palmor declined to comment on the explosion. The official SUNA news agency identified the driver as Nassir Awadallah Ahmed Saeed, 65, a Port Sudan businessman. Spokesmen for Sudan's police and armed forces were not immediately available for comment. Israel, which Sudan considers an enemy state, declined to comment on the 2011 blast that killed two people, and neither admitted nor denied a similar attack in eastern Sudan in 2009. While Sudan denies allowing illegal weapon shipments across its territory, analysts say smugglers bring in weapons through the country's east, then route them through Egypt's Sinai desert and into the Hamas- controlled Gaza Strip.